We hear a lot about giving firstfruits when it comes to money and financial increase. 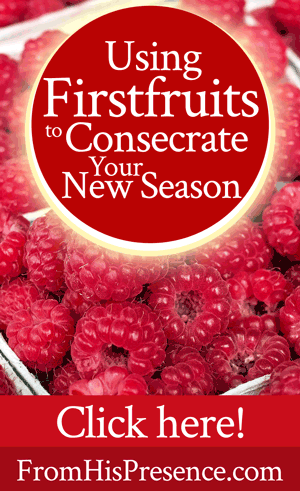 However, did you know that the principle of firstfruits is actually way bigger than that–and that it can help you prosper in your new season? Whenever I’m entering a new thing, Holy Spirit always impresses upon me to dedicate the first part of that season to simply seeking Him. When I obey, He always shows up with way more than I ever expected. He’s given me promises during those times of seeking–promises I thought I understood at the time, but later learned that I had NO IDEA how amazingly He was promising to bless me. He’ll purge me of anxieties, worries, and fears during those times, giving me His love, comfort, JOY, and peace instead. Sometimes He’ll tell me in advance what the new season will look like. Not always, but sometimes. Regardless of what God has in mind, He always does something amazing when I consecrate the firstfruits to Him. Related: Read my Heavenly Downloads for Your New Season series for huge, helpful tidbits about how to navigate your new season. The principle of giving God the first part of everything runs throughout Scripture. But seek first the kingdom of God and His righteousness, and all these things shall be added to you” (Matthew 6:33). Nevertheless I have this against you, that you have left your first love” (Revelation 2:4). The principle of giving God the first also applies to time. Holy Spirit convicted me long ago to seek Him first in my day, rather than playing my symphony first and tuning my instrument later. I can tell a huge, GIANT difference in both my level of intimacy with God, the flow and power of my day, and the level of blessing in my life if I give God the very first of my day. This is why the principle of firstfruits also applies to seasonal changes. When you give God the first and best of your new season, it’s a special thing. Your coming aside to spend time with Him at the FIRST of the year; the FIRST of the week; the FIRST day of a new season … these things are a powerful way of dedicating your new thing/time/season/week/etc to God, giving your life to Him afresh, and asking Him to do what He wills with it. Well, are you beginning something new right now? Can you feel yourself entering a new season? Are you starting a new endeavor, a new job, career, ministry, business, family, etc? If so, I encourage you to set aside time right at the beginning–the first–to dedicate your new thing to the Lord. Offer yourself anew to Him. Ask for His help, protection, guidance, and blessing. Ask Him to tune your ear to hear Him: to give you eyes to see Him, ears to hear Him, and a nose to smell His fragrance. Ask Him to make you more sensitive to the leading of His Spirit and more sensitive to His presence than you have ever been before. Pour out your heart to God. Give Him your best and hold nothing back! That’s the kind of prayer God can bless. Are you starting something new? Are you willing to stop right now and give your first to the Lord? Please leave a comment below! Oh wow! This could not have come at a more timely manner. I’m just starting a new business with Juice Plus+. It’s an MLM which makes me a little hesitant, but I love the product so much and the team I’m on are all Christian ladies that I just love the fellowship with and I’m feeling a bit overwhelmed with how to share it and wondering how God is going to use this new path i have started down in my life. I feel 100% confident of His hand in this otherwise I would’ve never signed up. I’m glad to have this for some guidance in pursuing His will for Juice Plus+ in my life. Go for it, Teresa! I’m excited for you and for your business. Father will help you if you commit your paths to Him. He will instruct you and teach you in the way you should go! Psalm 32:8. I’m in the process of finishing my doctorate in Clinical Psychology by the Summer. It will be a new season for me. I have also passed the Supervisor”s exam at my current job. So I’m also waiting to be promoted. So there’s a new season awaiting me. I will be in search of where God wants me to do an internship. So all kinds of new seasons are around me. I need to seek Him more, give Him more time so that I can be able to see, hear, feel Him and obey Him. I need him so bad right now. I’m also lonely and I want Him to bless me with a husband and to block the counterfeits. So, I soooo need Him right now.!!! I like the idea of smelling His fragrance, I definitely think I’m in a new season. Amen. May you be abundantly blessed in your new season, sis! Truly March is for change and marching orders are here . Tomorrow I leave for ? County where my daughter lives ; then she and I will drive to Redding for 4 days March 30th to visit Bethel and scout out the land. This has been several months in the waiting . On March 6 the Holy Spirit gave me marching orders for a new ministry assignment. Even though I know He will equip me with all that I need to accomplish this assignment, I have had some anxiety about stepping out into something that is relatively new to me. What you wrote has given me direction on how to proceed before moving ahead two weeks from now. Thank you, Jamie! Ayymen, Ellen! I’m thrilled to hear this. If you haven’t read it, the answers to FAQs I wrote here about stepping into a new season might really help you. Actually, the whole New Seasons series might really help you. It talks about how to get prayer directives for your new season, specific steps, and more. I pray that you would be anxious for nothing; but in everything, with prayer and supplication, with thanksgiving, you would make your requests known to God! And that the peace of God, which passes all understanding, would guard your heart and mind in Christ Jesus. In Jesus’ name (Philippians 4:6-7)! I here everyone talking about the Holy spirit living in them. how do you know?! i want to feel this 2!! can one hear the voice like in a fysical way ? how do you know .. i’m i doing something wrong? i know everybody is different and pray differently, maybe i’m praying wrong?? i just got an awful truth today if i don’t get on time to work one more time, my boss at the assignment is firing me ?don’t know what to do i really try but can’t get to work on time no matter when i go to bed, in need of prayers!!! Hi Javiera! What a wonderful question about Holy Spirit living inside you. Here’s how you can know: How Do You Get the Holy Spirit? Please read that article, for it will answer many of your questions! I pray Father God would also help you as you strive to be punctual and timely to your work. Thank you❣? A now message perfect time. Daddy God is telling me to begin song writing this moment. I’m going to listen to His lead. Thank you again for sharing His word with us?God bless you? AyyyMEN! SO thrilled to hear this, Seneida! I pray He would download the songs to you that they are singing in Heaven, and glorify His name!